❤ There's no need for screws or messy installations. Just peel off the backing, stick it to any clean and smooth places. Please start clipping away your spice bottles 48 hours later after sticking. 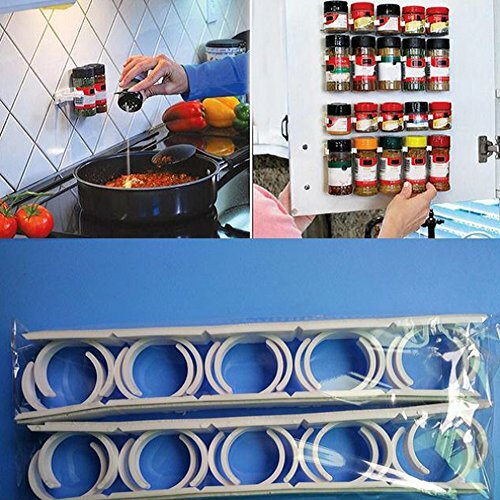 ❤ Modern kitchen spice rack all-in-one set for a joyful, organized and effortless cooking and dining experience. ❤ Multi-function: Kitchen shelf and rack for spice bottles, jelly jar, cans, Herbs, knife, spoon, ladle. Sturdy, durable and easy to clean. ❤ The round and elegant design of this bottle rack gives your kitchen a better look. Not just beautiful, it's also practical. This rack fits in kitchens with limited space.